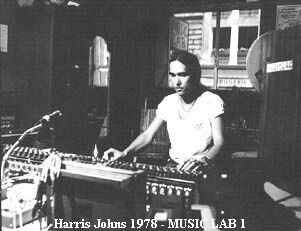 Harris Johns started the MUSIC LAB 1978 with 8-track equipment in a former stationary shop. There he recorded with Ideal, Einstürzende Neubauten and many other bands, especially from the Punkscene. 2 years later he moved to a loft in Kreuzberg near the then still existing wall at Charlottenstrasse and got heavily envolved with Metal. Gravediggers Heavy Metal Breakdown was the first trashmetal recording, followed by Helloween, Tankard, Voivod and many others. In 1987 he moved to a 320 squaremeter loft, where he had a big and a small studio as well as accomodations for the bands that came from all over the globe. Productions with Sodom, Kreator and many other metalbands made the studio famous in the metalscene. At this stage we used 24 tracks - first analog then digital - and a 38 channel desk with automation. Harris Johns did 80% of the productions. The other soundengineers and builders of the new studio where Frank Osterland and Angelo Plate. Later on the following soundengineers started their career at the MUSIC LAB: Jan Wichers, Simon Fuhrmann and Martin Erfurt. 1992 Harris bought a former guesthouse near Berlin to set up a bigger and different type of studio. 2005 he and his 3 partners restarted the MUSIC LAB BERLIN.